Give your family a view of the world from a new perspective and a reason to think you’re pretty awesome, too, on a vacation where all you have to do is book and show up to have fun. Travel with Trafalgar with new special-release trips for this week only on a vacation where the kids will be having too much fun to realize they have been given the ultimate education and the best part is Trafalgar handles every detail. Go to gladiator school in Rome, see where Harry Potter’s train left for Hogwarts in England or hike to the tallest waterfall in the United States at Yellowstone National Park during the one-week Buy One, Get One for 30 percent off flash sale. Give wallets a break with savings of up to $1,162 per couple* on guided vacations when booked through March 7, 2016, plus an extra 10 percent off** for young travelers ages 5-17. These handpicked vacations include all the essentials, from specially-selected four-star hotels, many local meals, VIP access to go straight to the front of the line at major sights, and an expert professional Travel Director accompanying guests the entire trip to provide concierge-style service. Recent studies have shown travel is good for kids, from bonding to improved education and social abilities. 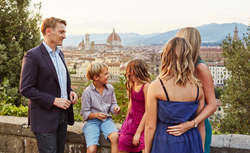 Get inspired by reading about the benefits of traveling with family at the newly-launched http://www.TrafalgarBlog.com. Featured trips are a blend of top-selling trips including Family Experiences that are engaging across all ages. Designed for families to discover and learn about the world through fun activities and fascinating insights, guests experience every destination like a local. A passionate naturalist takes guests on an easy hike to the tallest waterfall in the United States at Yosemite, one of America’s most famous National Parks during its 100th anniversary. Explore the Monterey Bay Aquarium before it even opens on a private behind-the-scenes tour. Feel the heavy weight of the sword in hand as an expert teaches families the age-old combat skills at a Gladiator training school, and shares tales of ancient Rome's fierce battles. Rome's history, Florence's romance and Venice's decadence – this trip introduces the different characters of Italy. Castles, Crown Jewels and Harry Potter – this classic family experience introduces the history, mystery and magic of England, Wales and Scotland. Enter a red telephone box to imagine Harry Potter's descent to the Ministry of Magic, find Platform 9¾ and search for the Hogwarts Express at this famous train station. Sense the rush when thousands of gallons of water gush from Old Faithful as a nature guide explains why this world-famous geyser exists at Yellowstone National Park. Stay in a 110-year-old historic ranch in rural Montana with welcoming down-home hospitality, a real saloon bar for the grown-ups, and enjoy its wide open country. Meet locals who strive to protect the sea turtles that nest in Tortuguero National Park. Hear how the turtles can weigh up to 1,100 pounds and that a female can lay more than 100 eggs in one go. See the excitement as families faces as they fly between trees on a zipline, adding to the squeals and shrieks of the jungle. To book a vacation, call Trafalgar’s Travel Experts at 866-544-4434, contact a Travel Professional or visit http://www.trafalgar.com/bogo30. Trafalgar is a proud supporter of the TreadRight Foundation. Created as a joint initiative between TTC’s family of brands, the TreadRight Foundation is a not-for-profit working to ensure the environment and communities we visit remain vibrant for generations to come. To date, TreadRight has helped support more than 35 sustainable tourism projects worldwide. The foundation’s guiding principle is to encourage sustainable tourism development through conservation, leadership and support for communities.